Does Medicare Cover Compression Stockings? Compression stockings and compression socks are designed to improve the blood flow in your legs. Your physician may recommend that you wear them to help with venous disorders or other conditions that affect your circulation. However, the high-quality options can be pricey, so many patients ask, does Medicare cover compression stockings? Unfortunately, in most cases, it does not. However, some Medicare supplement plans and some private health insurance plans do cover the cost, so it is important to check with your plan provider for details. Though the out-of-pocket expense is discouraging, compression stockings can be a valuable tool for the prevention and treatment of serious conditions that affect your overall health and wellbeing. Understanding how they work and which medical issues they are designed to treat may increase your confidence that compression stockings are a smart investment. At first glance, compression stockings and compression socks look a lot like regular hosiery, but when you look more closely, you will notice that the material is much thicker. They are made with stretchy fabrics like elastane or spandex, so they hug your ankles and legs firmly. They are designed to exert gentle pressure on your blood vessels to improve circulation, and they are available in a range of compression levels for varying degrees of pressure. Compression levels are classified by units of mmHg, and you can typically purchase lower pressure compression stockings over-the-counter. You will find 10-15 or 15-20 mmHg options at your local pharmacy. Higher pressure hosiery, from 20 mmHg to 50+ mmHg, is also available, but you should speak with your physician or vein specialist before making a selection. Most compression stockings use a graduated pressure system, so they are tightest around the ankles. They get progressively looser as they go farther up your leg. Depending on your specific needs, you can choose from socks that stop at the knees, stockings that go up to your thigh, or sleeves that cover your legs but not your feet. The pressure from compression stockings takes some of the workload from your blood vessels, which makes it easier for arteries to transport oxygenated blood to the lower half of your body. More important, these garments support the veins, which must work against gravity to move deoxygenated blood back to the heart. What Conditions Do Compression Stockings Treat? Improved circulation in your legs, ankles, and feet is a plus under any circumstances, so compression stockings are useful for treating a range of conditions. The lower-pressure versions can ease the tiredness, achiness, and swelling associated with spending long hours on your feet, which makes them popular with retail employees, waitstaff, and professionals who must stand for extended periods of time. Individuals recovering from surgery or on extended bed rest often wear compression stockings to ensure proper blood flow. Those who must sit for long periods, for example during air travel, may wear compression stockings to prevent discomfort and the possibility of blood clots. Athletes use compression socks to support their legs and ankles through strenuous workouts, and they often use compression sleeves on their arms. This prevents damage to muscles and speeds recovery through increased blood flow. One of the major issues that all of these conditions have in common is poor circulation of blood and fluids in the lower half of the body. Compression stockings create an environment in which blood moves more effectively, reducing the symptoms and side effects associated with these health concerns. Does Medicare Cover Compression Stockings for Severe Conditions? The standard Medicare plan does not cover compression stockings in most cases, but does Medicare cover compression stockings for severe conditions? There is one situation in which your compression garments may be covered. If your vein disease has progressed to the point where you have open venous stasis ulcers, your vein doctor may prescribe graduated compression stockings as part of your treatment plan. Medicare may cover the stockings in this case, because the stockings are serving as a dressing for your open wounds. If your situation qualifies for Medicare coverage, keep in mind that the gradient compression stockings you purchase must meet certain criteria. First, they have to be the type of stockings that are knee-high or lower. Second, they must offer compression between 30 mmHg and 50 mmHg. 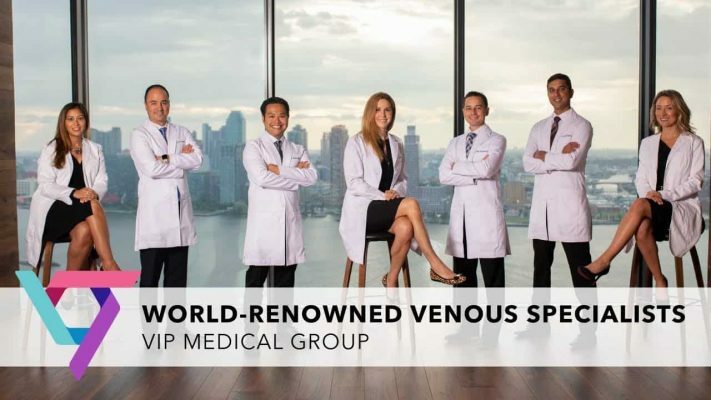 If you are experiencing venous stasis ulcers, see your vein doctor in New York or vein doctor in New Jersey for more information on treating this condition. How Do I Use Compression Stockings? It is important to consult your physician before you begin using compression stockings, particularly when you are considering higher levels of pressure. A proper fit is critical for maximum effectiveness, and stockings that are too tight can restrict circulation, rather than improving it. For the same reason, it is important to choose compression socks and compression stockings that are the right length. If you need to fold or roll them at the top or the bottom, they may become too tight in those areas. If you are wearing compression stockings to treat venous disorders, put them on before you get out of bed. This ensures that your vessels are in the optimal position when pressure is applied. Finally, smooth out the fabric once you put the compression stockings on. Wrinkled or bunched material can reduce effectiveness. When Should I See a Vein Specialist? Minor heaviness and achiness in your legs after a long day on your feet is common, and compression stockings that exert mild pressure can resolve these issues quickly. However, if you notice on-going or worsening symptoms like swelling, heaviness, and pain in your legs, leg cramps, varicose veins, and/or spider veins, see your vein doctor in NY or vein doctor in NJ for a comprehensive evaluation. These symptoms can indicate a more serious underlying vein disease, such as Chronic Venous Insufficiency (CVI). If this disease is left untreated, your symptoms may continue to worsen, leading to more varicose veins and spider veins, skin disorders, and in severe cases, venous stasis ulcers. The Vein Treatment Clinic offers the highest level of care, with Board-Certified vein specialists that have the education and experience to ensure you receive an accurate diagnosis and an effective treatment plan. These experts are focused on strong patient/physician relationships, and they make it a point to include you as a partner in the evaluation and treatment process. Staff members provide support if you have questions on what Medicare covers, and they can assist you with your private insurance plan, as well. Visit the Vein Treatment Clinic online to schedule an appointment or call the office at 855-386-0195.